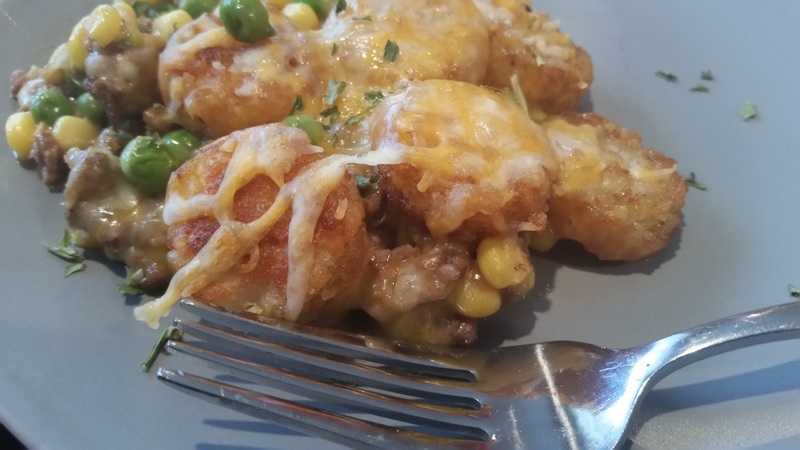 Shepherd’s Pie with Cheesy Tater Tot Topping – What's for Dinner Moms? Working the remnants of my refrigerator and freezer to get as many meals out of them as possible. We are getting down to the bottom of the meat freezer and have a bunch of single items in the regular freezer. I saw this idea on a blog post a week or so ago and thought it was just brilliant. Of course I didn’t save it and now cannot find the post. 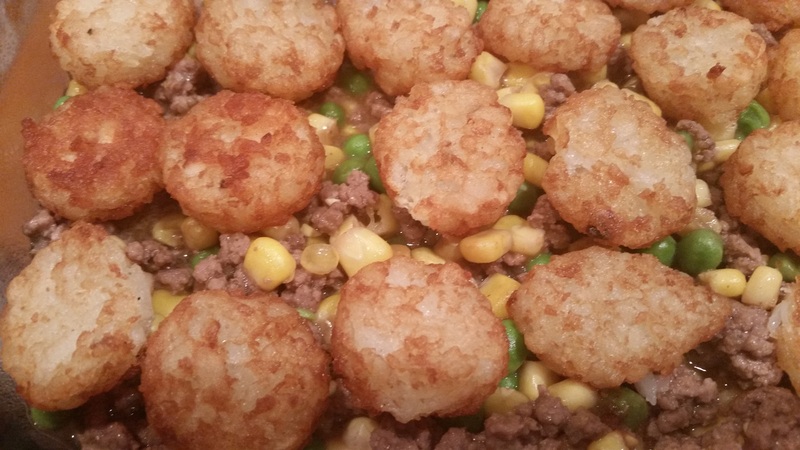 I want to give the person credit for the idea so if this was your post about using tater tots on top of the Shepherd’s Pie about a week ago please let me know! This meal helped me finish some ground beef, 1/4 bag of frozen peas, 2/3 bag of frozen potato crowns, and 1/2 a bag of frozen corn. Add in a few staples from my fridge and refrigerator and we had a tasty dinner! This was delicious and easy to make. My kids helped make dinner which was fun! One cooked the meat while the other baked the potato crowns to keep them crunchy, and then shredded the cheese for the topping. It was fun for us all to cook together. Both kids loved this and we had two lunch servings leftover for the next day. I served this with a salad to complete the meal. Cook the potato crowns according to package directions. Remove pan from oven and turn heat to 350 degrees. Cook ground beef in a skillet over medium heat. Break into small pieces as it cooks. Once the meat has cooked through remove the meat from the pan to a large bowl. Make the gravy according to package directions. Once gravy has thickened add to bowl with meat, vegetables, and gravy. Stir well. Pour into a 13″ x 9″ casserole dish. Place the potato crowns in rows on top of the beef mix. Sprinkle the top with cheese and bake for 25-30 minutes until cheese is melted and bubbly. Remove pan from oven and allow to rest 5 minutes before serving. That sounds great! I love mashed potatoes but my texture aversion son not so much. He will eat them but they have never been a favorite. I would eat them every day. Great idea. I need to dig around in my freezer too. Looks great! I am sure this is another one my boys and I will love! LOL!!! I am happy to hear that! This sounds different and good!